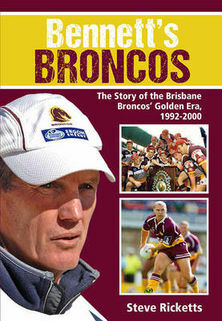 Steve Ricketts’ latest book, ‘Bennett’s Broncos’ has created widespread media interest, with television, radio and print picking up on some of the revelations from interviews with the 38 players involved in the five grand final wins between 1992 and 2000. Whether it is Kevin Walters talking about his fall-out with Bennett, or John Plath talking about his regrets over his hard living ways, there is something for all league fans in the 24 chapters. Shane Webcke expands on his struggle to come to grips with retirement while Tony Currie reveals that his biggest pay day came at the end of his career, when he was over the hill. Peter Ryan says he is still dirty on former judiciary boss, Ron Coote over a long suspension for foul play, while Chris Johns is adamant Terry Lamb was intimidated by Wally Lewis. There are a host of rugby league books on sale now, but with Bennett returning to the Broncos in 2015, ‘Bennett’s Broncos’ is compulsory reading.